Hershey is a week-long celebration of old cars, really old cars. Sure, there are plenty of not-so-old cars running around town, but it is nothing like Monterey, Amelia or even Scottsdale where McLaren P1s and Ferrari 488s seem to be ubiquitous. Hershey is pre-war country this week and it is reflected in the consignments at RM Sotheby’s auction. This is Sports Car Digest, and there were a few readily recognized sports cars (Austin-Healey, Sunbeam Alpine, Porsche Speedster, etc.) on the docket. More importantly, however, the RM Sotheby’s consignment featured a number of sports cars from the dawn of the motoring era, Speedsters and Runabouts with names like E-M-F, Mercer, Chalmers and Pullman that don’t come readily to mind in word-association with the term ‘sports car’. Yet, they are extremely important. They defined the sports car concept at its most elemental [and these vehicles are nothing if not elemental.] Their four- and six-cylinder engines may not have much sophistication by present-day standards but for their time they were powerful, innovative and imaginative. Many of the ones on offer at RM Sotheby’s were highly original or well used older restorations, ideal for taking out on a crisp fall day for a blast down winding lanes with goggles on and a flat cap turned backward. They would have delighted Henry Austin Clark, Jr. and his early collecting contemporaries in whose hands they have been maintained, preserved and restored. Hershey is always a good time, even when the weather is awful (which it wasn’t this year.) The opportunity to observe and inspect the originality of thought and design of these early sports cars is part of the charm and appeal. Even more appealing is the fact that, as evidenced by some of the results in Hershey, they’re not expensive. It is an economical way to experience something that few people in recent generations have enjoyed. 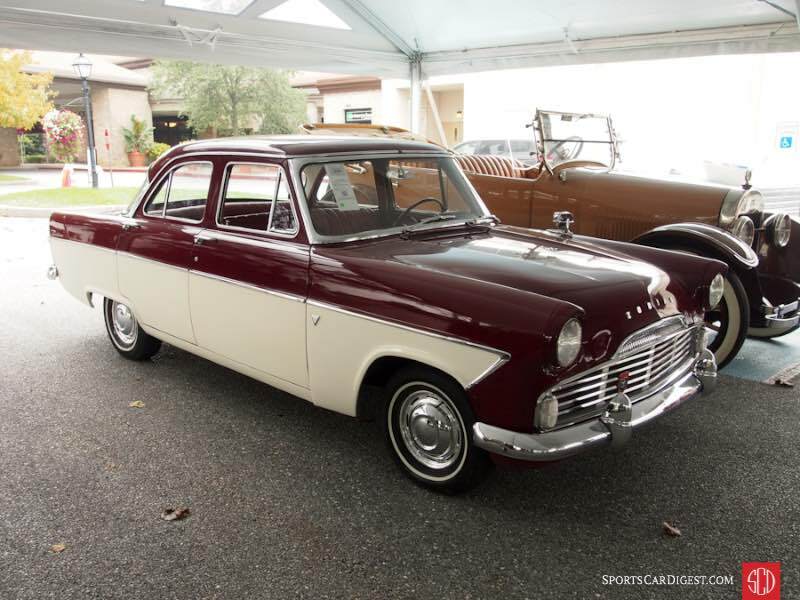 Lot # 111 1960 Ford Zodiac Mk II 4-Dr. Sedan; S/N 206E241841; Burgundy, Cream/Burgundy leatherette; Estimate $10,000 – $15,000; Cosmetic restoration, 3 condition; No Reserve; Hammered Sold at $4,000 plus commission of 10.00%; Final Price $4,400 – 2,553/86hp, automatic, fender mirror, wheel covers, narrow whitewalls. – U.S. delivered lefthand drive model. Good upholstery, dashboard and chrome. Old, fraying window channels. Painted assembled with masking oversights and erratically wet sanded orange peel. Underbody has old, gloppy, dirty undercoat. Superficially cosmetically restored to mediocre standards. – Definitely unusual and cosmetically restored well enough for its inherent qualities, a rare saloon from Ford England that will fill a blank spot in most Ford collections. 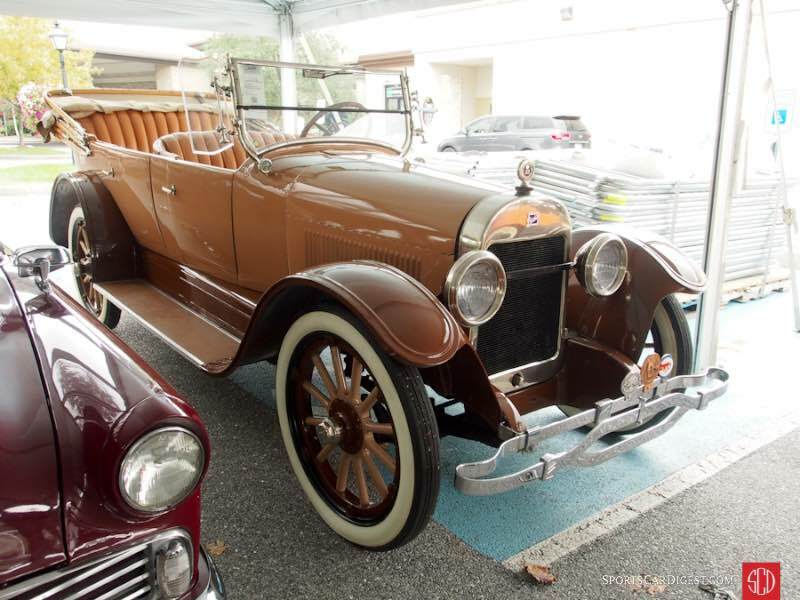 Lot # 112 1922 Buick Model 22-45 Touring 5-Passenger; S/N 786958; Butterscotch, Brown fenders/Butterscotch vinyl; Beige cloth, Tan piping top; Estimate $25,000 – $30,000; Older restoration, 3+ condition; No Reserve; Hammered Sold at $22,500 plus commission of 10.00%; Final Price $24,750 – Wood spoke body color wheels, wide whitewalls, single rear spare, varnished wood top bows, rear seat footrest and courtesy light, Stewart speedometer, wind wings. – Very good paint, nickel trim, upholstery and top. Chassis was done a while ago and is somewhat grimy. The cosmetics are holding up very well. More than good enough to tour proudly. – The colors are dated, suggesting a restoration in the 70’s or 80’s and the car’s condition (as well as the 13 miles showing on its odometer since it was done) suggest a reasonably good life with little use and very good care. This is Model T money for a quality 6-cylinder valve-in-head Buick with 60hp and represents a strong value for the money. 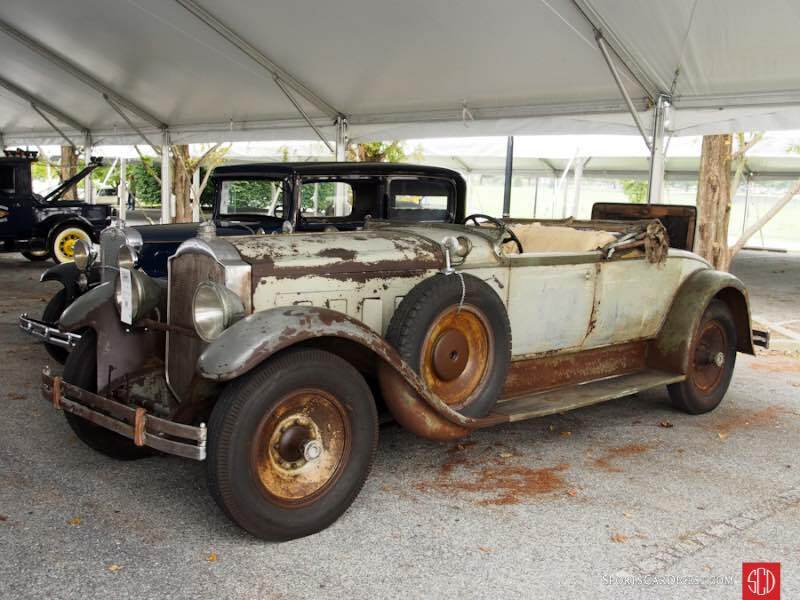 Lot # 114 1929 Packard Deluxe Eight 645 Roadster, Body by Dietrich; S/N 174037; Engine # 174223; Light Grey, Grey fenders/Orange vinyl, Tan chamois, Grey leather panels; Black cloth top; Estimate $55,000 – $75,000; Unrestored original, 4- condition; No Reserve; Hammered Sold at $56,000 plus commission of 10.00%; Final Price $61,600 – Dual sidemounts with mirrors, disc wheels, blackwall tires, rumble seat, top frame and bows, red plastic ‘Muncie’ shift knob. – Peeling, surface rusted body panels, scabrous bright trim, tattered upholstery and top but sound old inside door panels. No windshield or sidemounts. Exposed metal has been slathered with WD40 to retard rusting. Chassis and running gear are uniformly grimy. Brake linkage has been worked on and the engine compartment is orderly and functional. Runs and drives. Remarkably sound body with no rust through at all. Don’t restore it, just drive. – It’s all about the potential which I would argue is best achieved by leaving it alone other than making it work properly, fitting a windshield and taking it out on the highway for some fun. It would be a sensation. Then restore it, a straightforward, if expensive, project. The bidders paid all the money for the potential, but not too much. 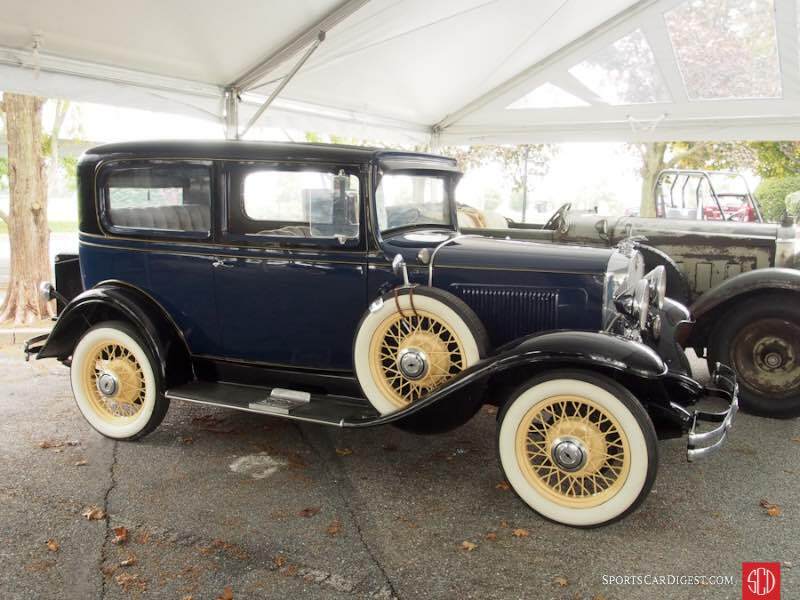 Lot # 115 1931 Chevrolet Independence AE 2-Dr. Sedan; S/N 563808; Engine # 2312735; Dark Blue, Black fenders and roof/Grey cloth; Estimate $25,000 – $30,000; Recent restoration, 2+ condition; No Reserve; Hammered Sold at $15,000 plus commission of 10.00%; Final Price $16,500 – Cream wire wheels, wide whitewalls, dual sidemounts with mirrors, metal luggage trunk, windshield visor, wind wings, rear seat smoker’s kits, radiator stoneguard, dual electric horns. – Excellent paint, chrome and interior. Carefully restored engine and chassis without going beyond original finishes. Paint is unblemished; upholstery, interior trim and woodgraining are pristine. This is an exceptional Chevrolet. – Particularly for an enclosed coach body and it brought a decidedly modest price considering the thoroughness and quality of its restoration and the comprehensive equipment list. 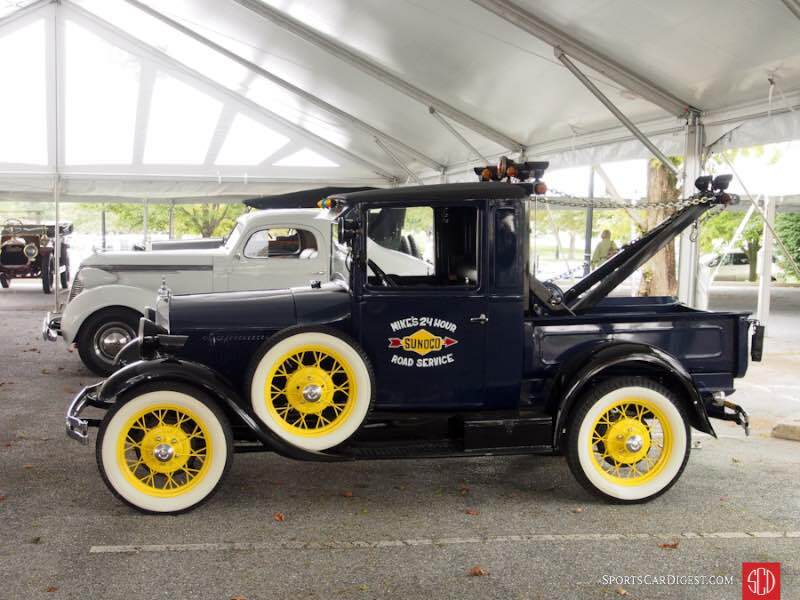 Lot # 118 1928 Ford Model A Tow Truck; S/N A29843; Engine # A3456621; Washington, blue, Black fenders/Black vinyl; Estimate $25,000 – $30,000; Truck restoration, 2- condition; No Reserve; Hammered Sold at $23,000 plus commission of 10.00%; Final Price $25,300 – Yellow wire wheels, wide whitewalls, hand cranked boom, emergency lights, spotlight, turn signals, single left side spare, Waltham clock, fuel, oil pressure and temperature gauges, Moto-meter, 3-speed with overdrive. – Very good paint and major chrome. Some weak trim chrome and orange peely paint. Derrick is custom built to high standards. Engine and chassis are restored like new. The inside of the cab back panel was painted over old rust pits. – Although there are shortcuts in this Model A’s restoration it is still a standout, cheery old truck that would be a terrific accent piece for any garage or in the paddock of a vintage race meeting. It was sold for $27,500 at Auburn Fall in 2012 and is appropriately priced today within 10% and two bidding increments of its prior result. Lot # 121 1951 Willys M38 Jeep Utility; S/N MC36583; Olive Drab/Olive cloth; Estimate $30,000 – $50,000; Older restoration, 2 condition; No Reserve; Hammered Sold at $35,000 plus commission of 10.00%; Final Price $38,500 – Loaded with equipment including a pedestal mounted propane-firing water-cooled .30 caliber and air-cooled .50 caliber machine guns, radio, siren, axe, shovel, M1 Garand and more. 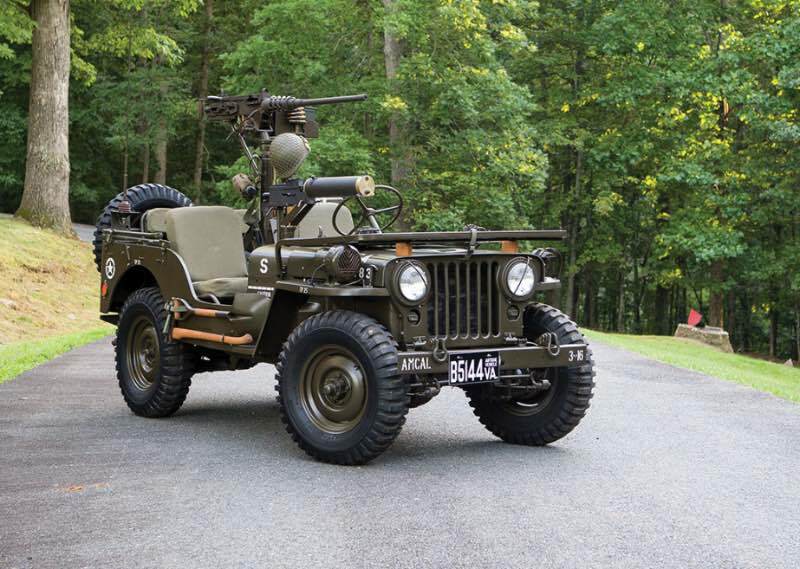 – Meticulously restored and impeccably maintained in authentic military style without going overboard, an exceptionally good example of the Korean Conflict era Jeep by Willys. – Sold for $29,052 at Auburn Fall in 2004 then an astounding $104,500 at Barrett-Jackson WestWorld in 2009 in what must have been a charity sale. It is a quality example and is well worth the price it brought here. 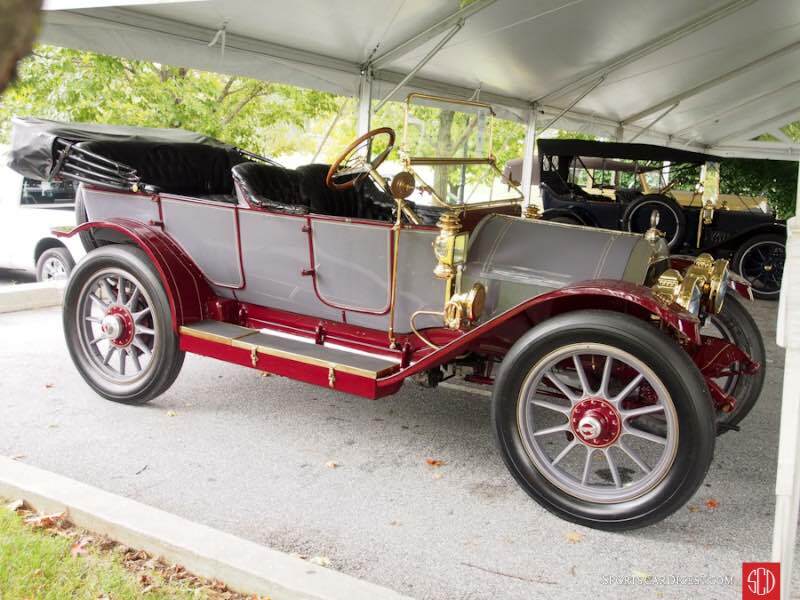 Lot # 122 1912 Overland Model 61T Touring; S/N 611191; Engine # 11380; Grey, Burgundy fenders and frame/Black leather; Black leatherette top; Estimate $90,000 – $110,000; Concours restoration, 2- condition; With Reserve; Not sold at Hammer bid of $65,000 ~ $65,000 – RHD. Castle acetylene headlights, kerosene sidelights, small halogen auxiliary lights, Rubes bulb horn, Stewart speedometer, grey 36 inch wood spoke wheels, dual rear mounted spares, Castle kerosene taillight, New Ormond 8-day clock, upgraded with overdrive and a 12-volt starter. – Very good older paint and interior with a few chips on the paint and mellow patina on its leather. Good brass showing age and some peeling varnish. Chassis is clean and orderly, showing moderate touring miles and good maintenance. A quality older concours restoration that has been on the road after its show season ended and is still an automobile to be proudly owned and driven. – The seller understandably declined to part with this Overland at this bid, a number than undervalues both the Overland and its restoration. 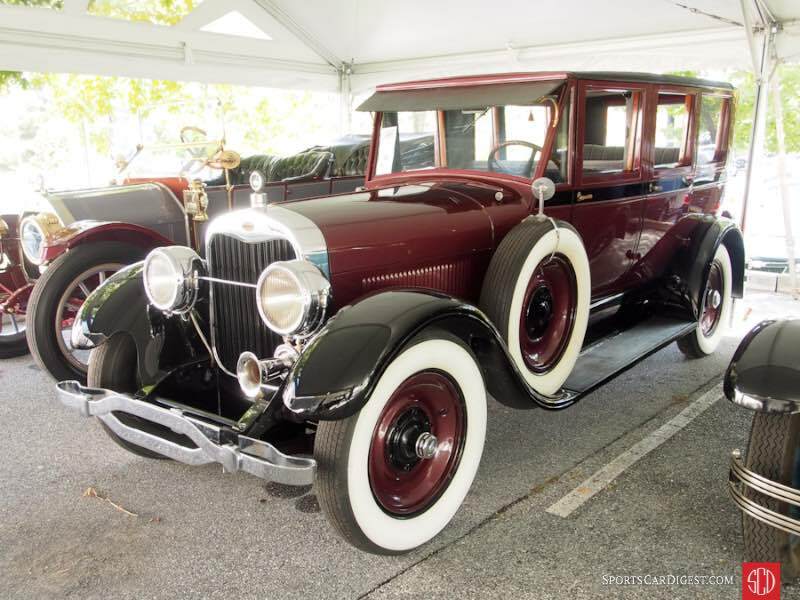 Lot # 123 1925 Lincoln Model L Limousine, Body by Brunn; S/N; Metallic Burgundy, Black fenders and accent/Black leather, Grey cloth; Estimate $50,000 – $60,000; Cosmetic restoration, 3- condition; No Reserve; Hammered Sold at $25,000 plus commission of 10.00%; Final Price $27,500 – Body color disc wheels, wide whitewalls, dual sidemounts, jump seats, windshield visor, crank up division window, varnished wood trunk, pulldown rear compartment window shades. – Sound but scratched and chipped old paint. Good interior and major chrome, thin hubcap chrome. Dull old dash and instruments. Oily, grimy engine and running gear. Good interior wood. A usably but superficially cosmetically restored parade car. – No-saled at Fall Auburn in 2002 with a reported bid of $27,000 and titled by its body number, 34686. The cosmetic restoration is expedient, sufficient for touring and local shows and lends itself to the investment of hours and gallons of solvents to clean up the engine compartment and chassis. It is a quality automobile at a reasonable price.